For many years I’ve constantly been receiving hundreds of e-mails every day. A lot of them work-related, a number of them personal. And I’ve never seen this is an issue, since I have an approach that works for me. Many people complain that e-mail is broken, but I think it’s a great communication form. I can deal with it when I feel I have the time and can get back to people when it suits me. If I need to concentrate on something else, I won’t let it interrupt my flow – just have notifications off/e-mail closed/don’t read it, and then get to it while you can. Your miles might, and will, vary, of course, but here are the main things that have proven to work very well for me. When you open up your Inbox with all new e-mail, deal with it. Now and then. Because having seen the e-mail, maybe even glanced at some of the contents beyond the subjects as well, I believe it has already reserved a mental part of your brain. You’ll keep on thinking about it till you actually deal with it. In some cases, naturally it’s good to ponder your reply, but mostly, just go with your knowledge and act on it. Some things are easiest to deal with directly, some need a follow-up later on (more on that in Flags and Filters below). Utilize different flags for various actions you want. Go through your Inbox directly, reply to the e-mails or flag them accordingly. It doesn’t have to be Inbox Zero or similar, but just that you know and are on top of each and every e-mail. No need to act, no need to watch it. But it is plausible that this topic and discussion might come up in the future, so file it just for reference. The rest of it is Throw away. No need to act, watch or file it? Get rid of it. Getting e-mails from the same sender/on the same topic on a regular basis? Set up a filter. This way you can have the vast majority of e-mail already sorted for you, bypassing the Inbox directly. Make them go into predefined folders (or Gmail labels) per sender/topic. That way you can see in the structure that you have unread e-mails from, say, LinkedIn, Mozilla, Netflix, Facebook, British Airways etc. Or e-mails from your manager or the CEO. Or e-mail sent to the team mailing list, company branch or all of the company. And then deal with it when you have the time. 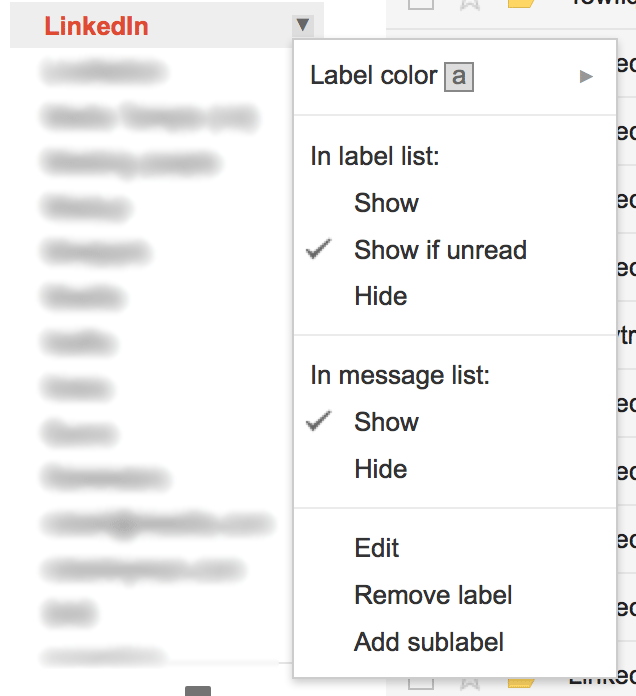 Gmail also has this nice feature of choosing to only show labels in the left hand navigation if they have unread e-mails in them, making it even easier to see where you’ve got new e-mails. Let me stress that this is immensely useful, drastically reducing which e-mails you need to manually filter and decide an action for. If you have a busy period when replying properly is hard, still make sure to take the time to acknowledge people. Reply, say that you’ve seen their e-mail and that you will get back to them as soon as you have a chance. They took the time to write to you, and they respect the common decency of a reply. How many newsletters or information e-mails are you getting that you don’t really care about? Maybe on a monthly basis, so it’s annoying, but not annoying enough? Apply the above suggestion filters with them or, even better, start unsubscribing from crap you don’t want. Whether you use an e-mail client, Gmail or similar, make sure to learn its features. Keyboard shortcuts, filters and any way you can customize it to make you more efficient. For instance, I’ve set up keyboard shortcuts for the above mentioned flags and for moving e-mails into pre-defined folders. Makes the manual part of dealing with e-mail really fast. E-mail doesn’t have to be bad. On the contrary, it can be extremely powerful and efficient if you just make the effort to streamline the process and use it for you, not against you. E-mails aren’t a problem, they’re an opportunity. 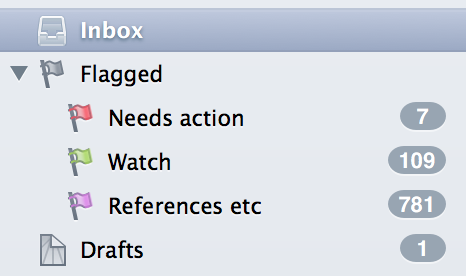 I’ve used zero-inbox and an “Action” folder for emails that need to be acted upon for the last 7 years. Flags, however, might be a better and a little more fine grained system. I think I’ll give your suggestion a spin for a while and see how it goes! Thanks for the tip! Yeah, just an action folder takes you a long way to begin with. followup.cc has been a really useful tool for me. Here’s an example: In the scenario where you’re too busy right now you can reply telling the original sender that you’ll get back to them in, say, 3 days. And you can BCC in 3d@followup.cc. Then, in 3 days time followup.cc will send you an email reminder bringing that email thread back to the top of your inbox. That sounds like a nice option, but maybe a bit tedious having to BCC that? I mean, compared to Mailbox or similar who has this functionality built in when you swipe an e-mail. One positive is that it’s an application-independent solution so whether in GMail, a native app, on mobile or a different machine you’ll get the reminder. Maybe Mailbox syncs reminders across devices? Yeah, that is a very good point. Good question about Mailbox, not sure if they do that or not. The reminder system there is is easy and works well, but I found myself with just constantly putting things off because the reminder never came at the “right” time. That’s why above solution works better for me, now I’ll check the Action and Watch flags when it suits me best, and then act on those e-mails.